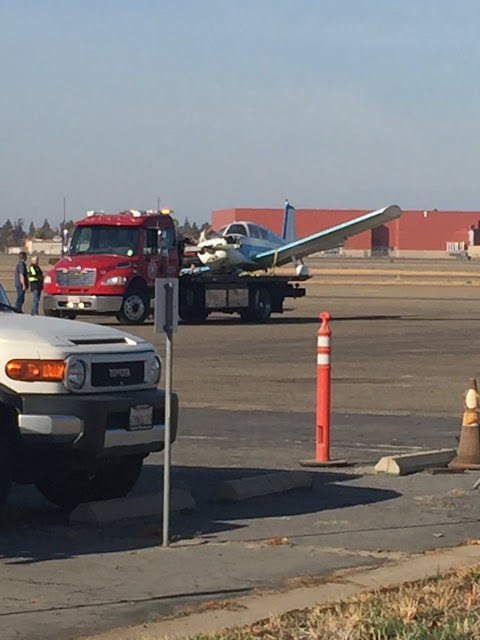 FRESNO, Calif. (KFSN) -- Investigators are on the scene of small plane crash at Fresno Yosemite International Airport. 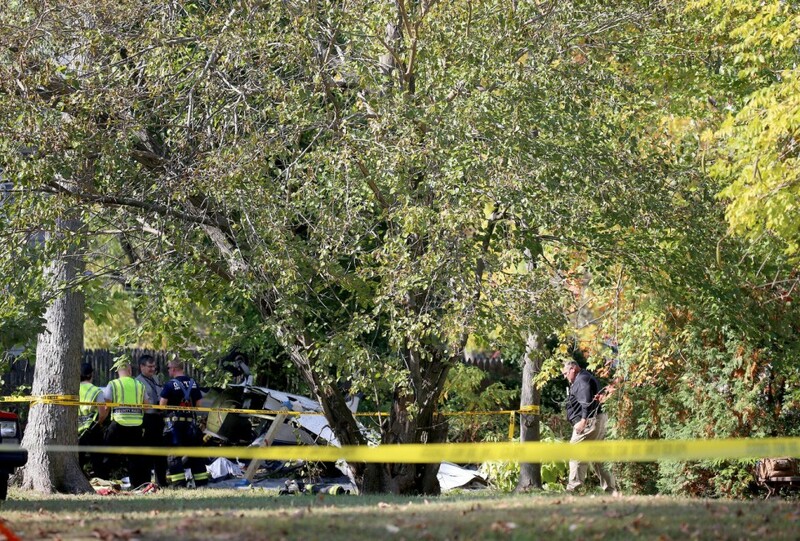 FAA spokesperson said a Piper PA-28 aircraft crashed on the runway shortly after 2:30 p.m. 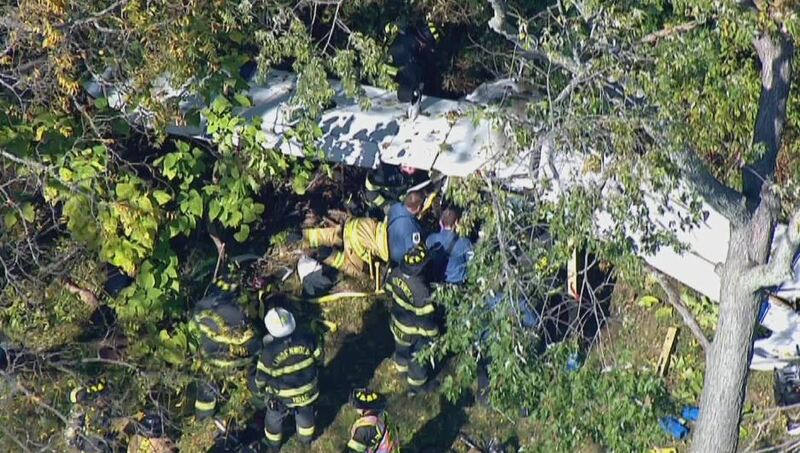 Authorities said the pilot was the only person on board and his condition remains unknown at this time but he was taken to the hospital. An FAA spokesperson said that they believe the plane crashed while attempting to land. The FAA and NTSB will take over the investigation as they try to uncover the reason behind the crash. 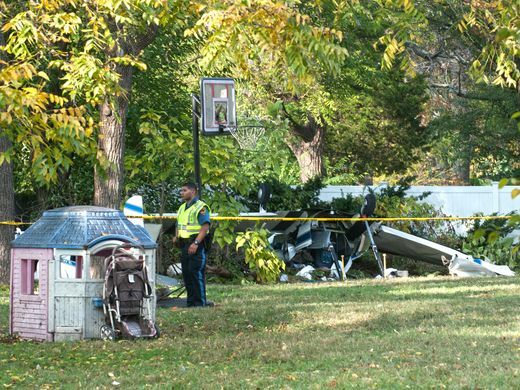 On October 19, 2016, about 1320 eastern daylight time, an Ercoupe 415C, N415WE, was substantially damaged when it impacted terrain in Lindenwold, New Jersey. 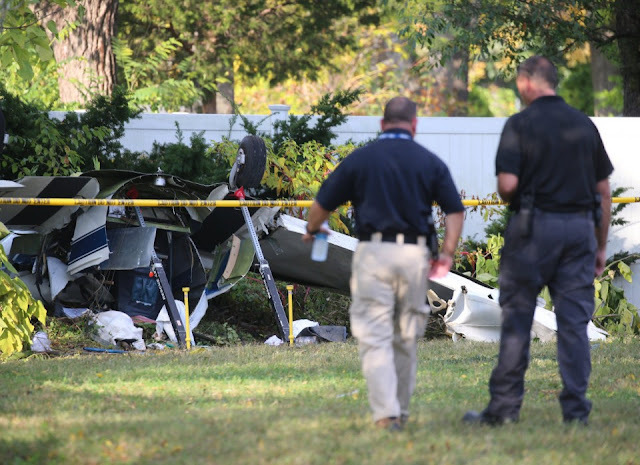 The private pilot and passenger were seriously injured. No flight plan was filed for the flight that originated at Flying W Airport (N14), Lumberton, New Jersey. Visual meteorological conditions prevailed for the personal flight conducted under the provisions of 14 Code of Federal Regulations Part 91. 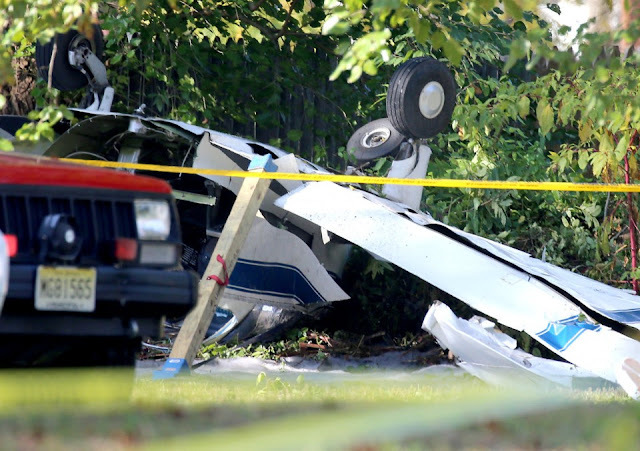 According to a Federal Aviation Administration inspector, the pilot reported that he rented the airplane at Claremont Airport (58M), Elkton, Maryland, and added 9 gallons of fuel to the airplane before departing. He flew to N14 without incident to pick up the passenger, and they then departed for a local area flight. 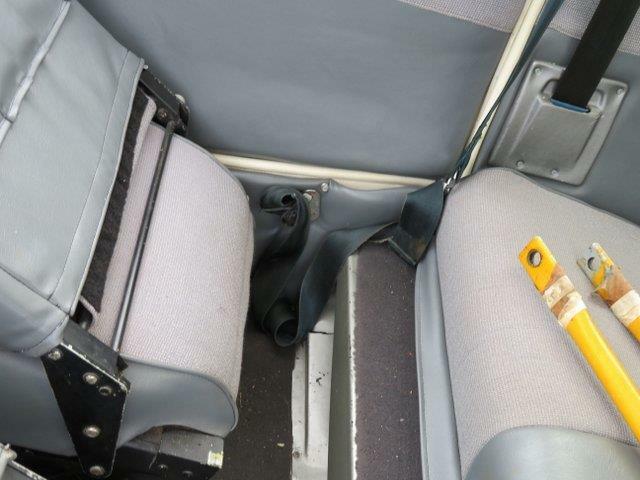 The passenger reported that during the flight the pilot stated, "something was wrong with the throttle" before the engine began to lose power. The airplane subsequently impacted terrain and sustained substantial damage to the wings, fuselage, and the cockpit. 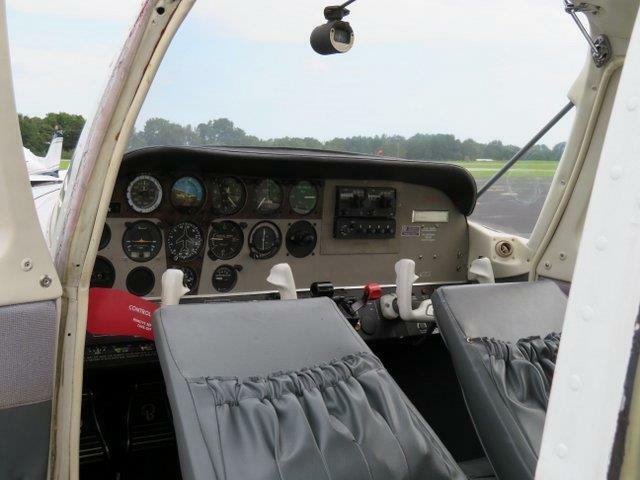 The two seat, low wing, tricycle landing gear-equipped airplane, was manufactured in 1946. It was powered by a Continental C-75, 75 horsepower engine. 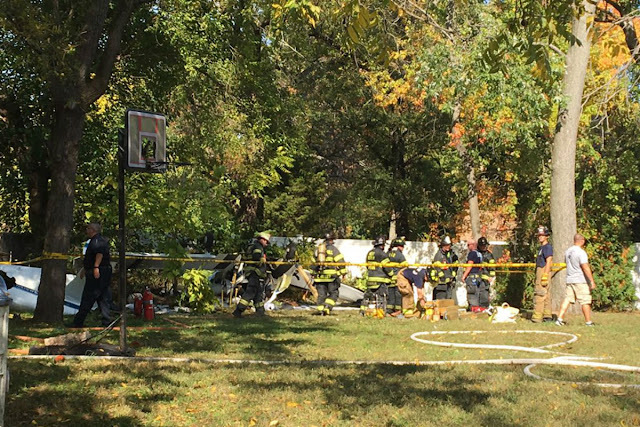 The wreckage was retained for further examination. LINDENWOLD - A small plane that crashed into a backyard here Wednesday rolled away on the back of two trucks Thursday. 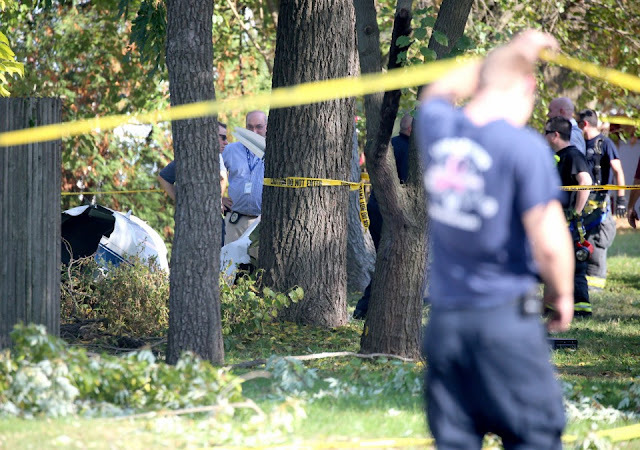 Neighbors watched from nearby lawns as workers placed battered pieces of a two-seater aircraft onto a trailer near the crash site on the 500 block of East Linden Avenue. 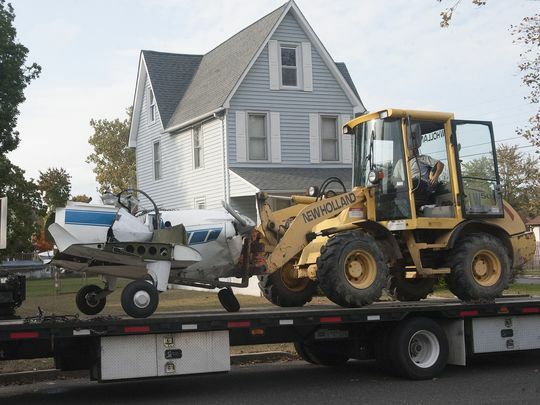 A front end loader lifted the front of the plane's fuselage, including its cockpit, onto a flatbed truck. 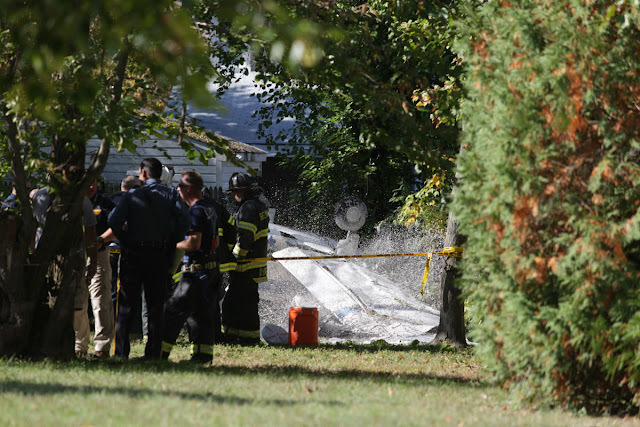 The plane was carrying two South Jersey men when it crashed behind a home around 12:45 p.m. Wednesday. Lindenwold police said Wayne Gilchrist, 66, of Marlton was flying the plane, while 72-year-old David Misek of Cherry Hill was a passenger. 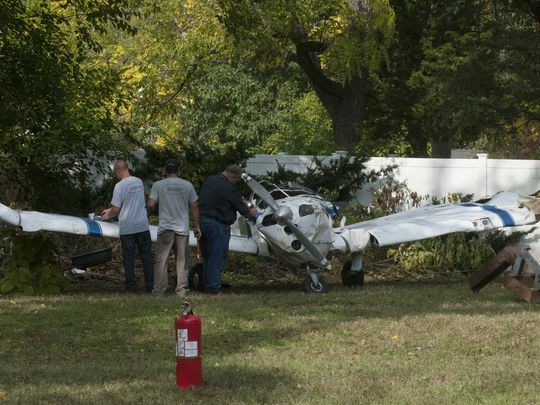 Misek told investigators the plane, which was made in 1946, “experienced an unknown mechanical issue just prior to the crash,” Lindenwold Police Det. Christopher Sherrer said in a statement. Misek, a Rockingham Court resident, was awaiting surgery Thursday for a broken hip at Cooper University Hospital, Camden. 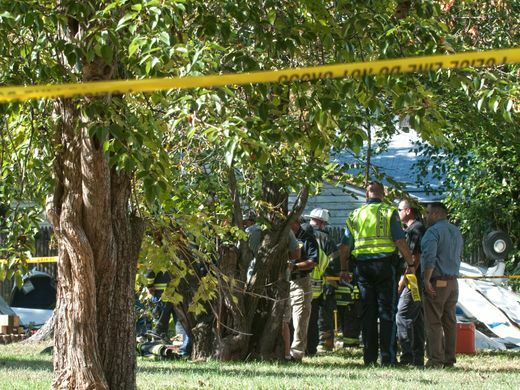 Gilchrist, a Kettering Court resident, received “a large number of stitches” for "severe facial lacerations,” according to Sherrer. 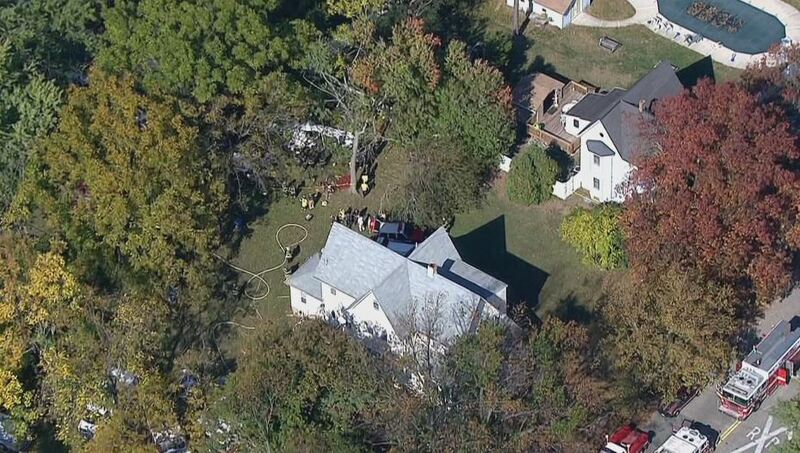 The pilot has been unable to speak to investigators, he added. 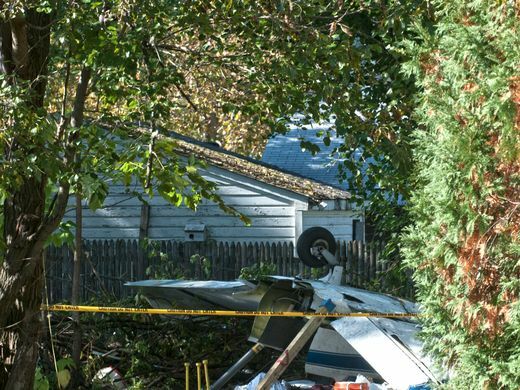 Authorities said the plane, which took off from Flying W Airport in Medford, narrowly missed several houses when it came down, then broke apart in the wooded yard. Gilchrist and Misek were trapped inside the overturned cockpit for about a half hours before emergency personnel could free them. 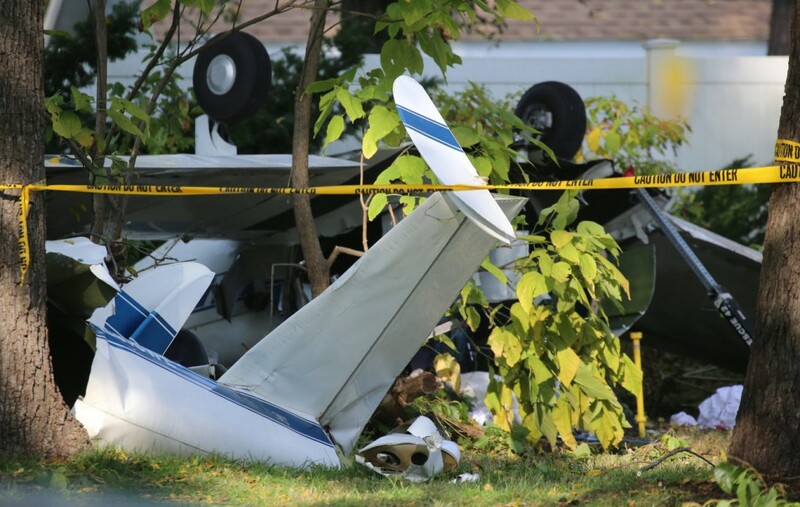 Gilchrist had rented the plane in Maryland, then flew to South Jersey for an excursion with Misek, according to the aircraft's owner, Daniel McCaffery of Chesapeake City, Md. McCaffery had initially identified Gilchrist as a Delaware resident. 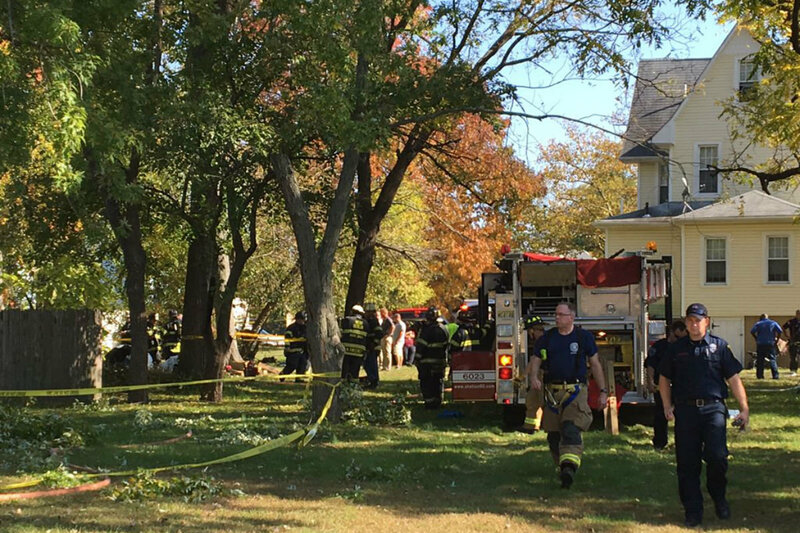 LINDENWOLD - Two men were hospitalized after a small plane crashed into the backyard of a borough home Wednesday afternoon. 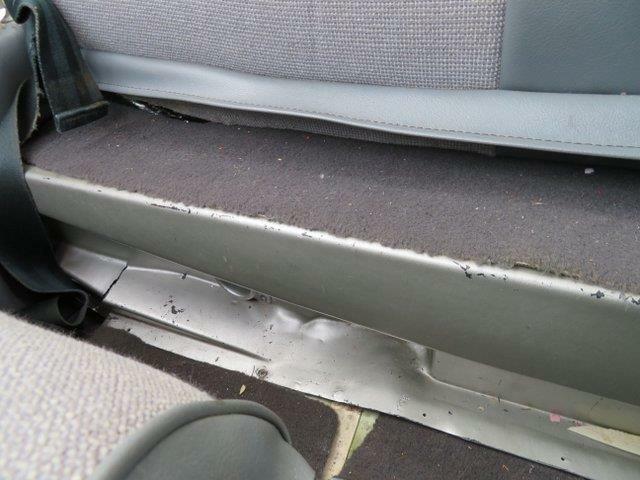 But the damage "could have been a lot worse," Lindenwold Police Chief Tom Brennan said. 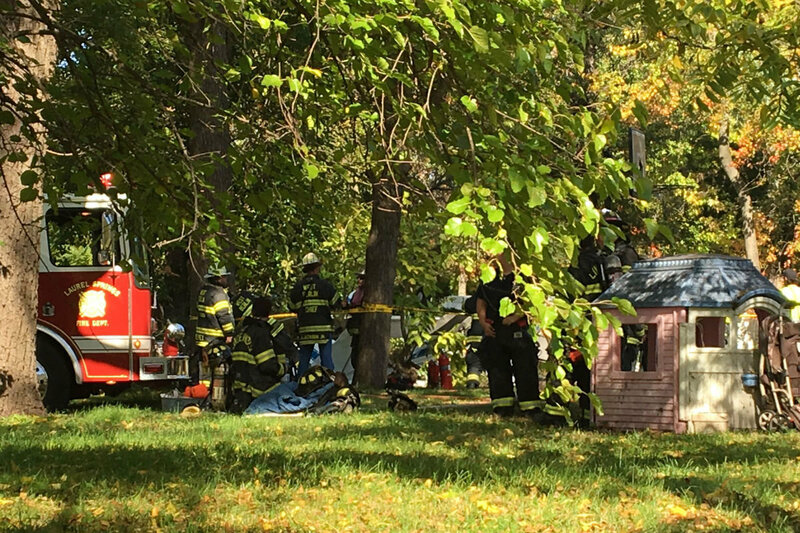 He said the vintage two-seater plane narrowly missed several houses when it crashed around 12:45 p.m. in the 500 block of East Linden Avenue. "It looks like it came between about four homes, kind of on a diagonal, struck some trees and ended up on the ground," the chief said. "No one on the ground was injured." 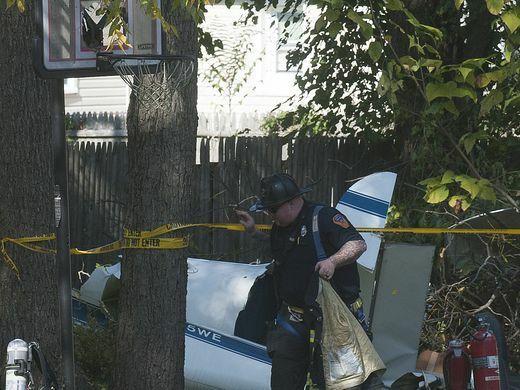 "I don't know what caused this but I think (the pilot) did a pretty nice job of putting it down," said the plane's owner, Daniel McCaffery of Chesapeake City, Maryland. 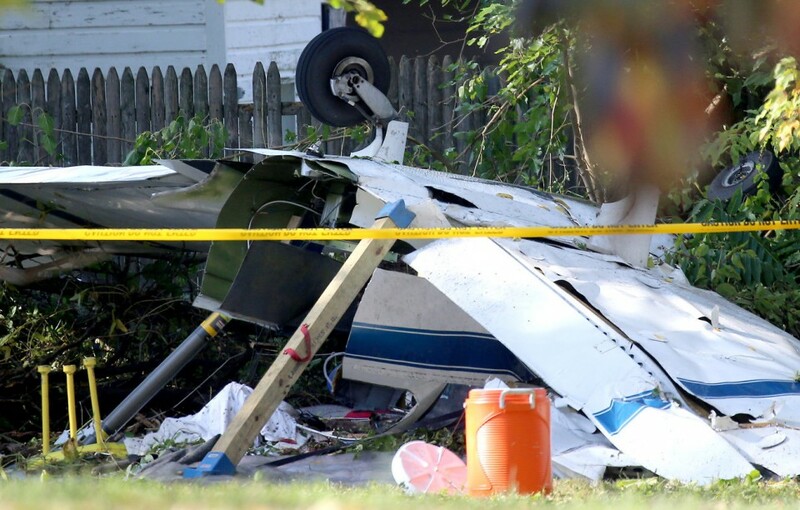 McCaffery said he had rented the 70-year-old aircraft Wednesday to a Delaware man, Wayne Gilchrist, who flew to South Jersey to go flying with a friend. 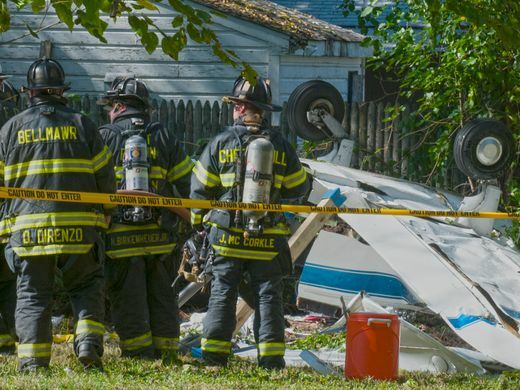 Gilchrist and his passenger were trapped in the plane's overturned cockpit for about 30 minutes before firefighters could free them, Lindenwold Fire Chief Michael Nolan said. One was flown by helicopter to Cooper University Hospital, Camden, while the other was taken there by ambulance, he said. "They are expected to survive," Brennan said of the men, who were admitted to Cooper University Hospital in Camden. "They were unable to communicate when they were extricated," said Brennan, who described the victims as "semi-conscious." Authorities identified the men only as a 66-year-old pilot and a 72-year-old passenger. 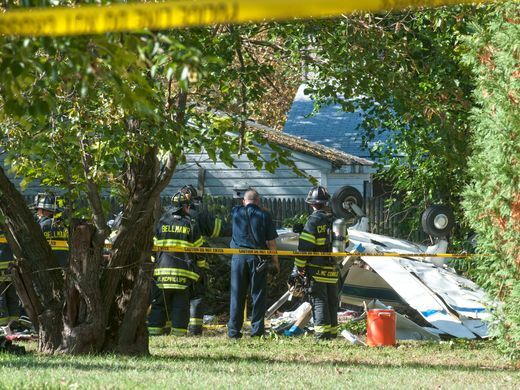 The plane, an Ercoupe 415-C made in 1946, had taken off from Flying W Airport in Medford prior to the crash, said the Federal Aviation Administration. 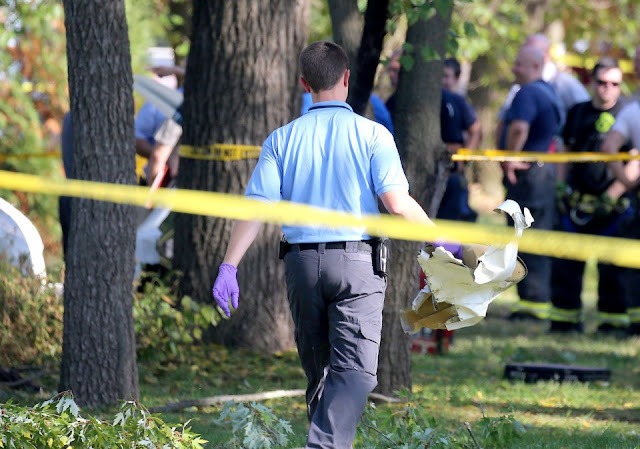 "It's a total loss," McCaffery said of the white-and-blue plane, which broke apart on impact. 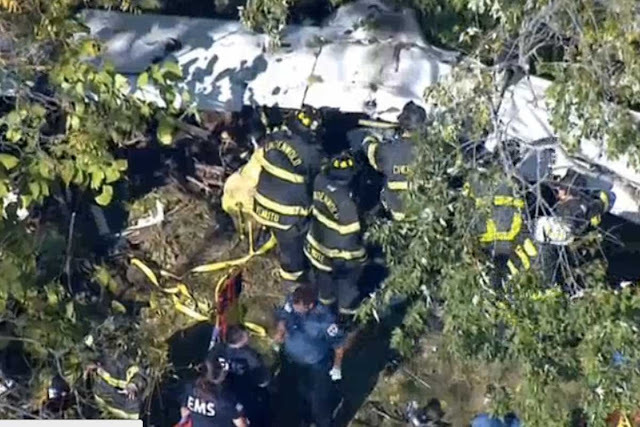 The front of the aircraft's fuselage, which had flipped so its wheels were in the air, lay about 6 to 8 feet from the twisted tail section. Doretha Williams said she was shocked to come home Wednesday afternoon to find the wreckage in her yard. 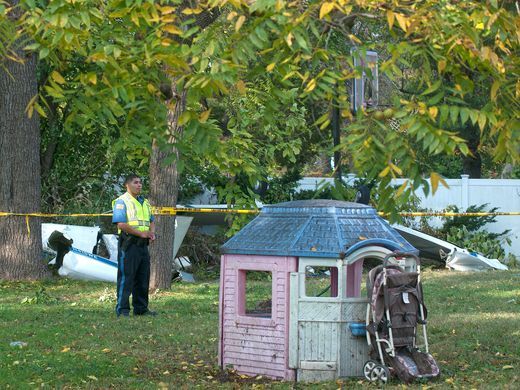 "I'm glad that no kids were out playing," said Williams, who noted she hosted a children’s party in the yard over the weekend. A woman who lives next door to the accident scene said the crash "sounded like an explosion." 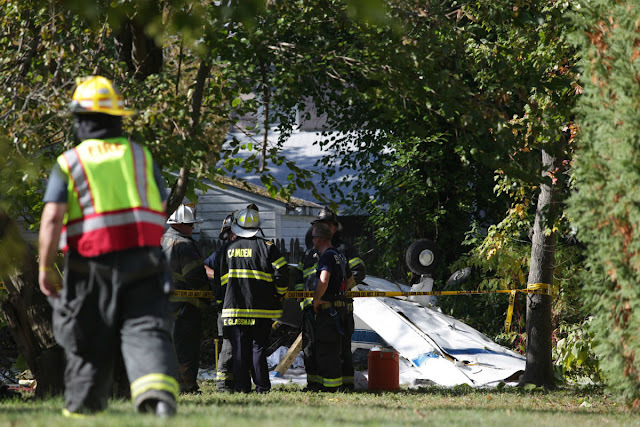 The air crash is believed to have been the first in Lindenwold in more than 30 years. 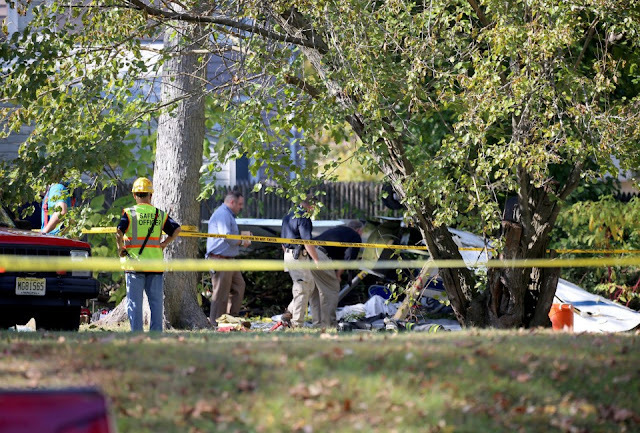 Brennan said his reaction upon learning of the accident was, “Are you kidding me?" "But here we are," he said as emergency vehicles from across Camden County lined Linden Avenue. FAA investigators were on the scene by 2:30 p.m, with personnel en route from the National Transportation Safety Board. 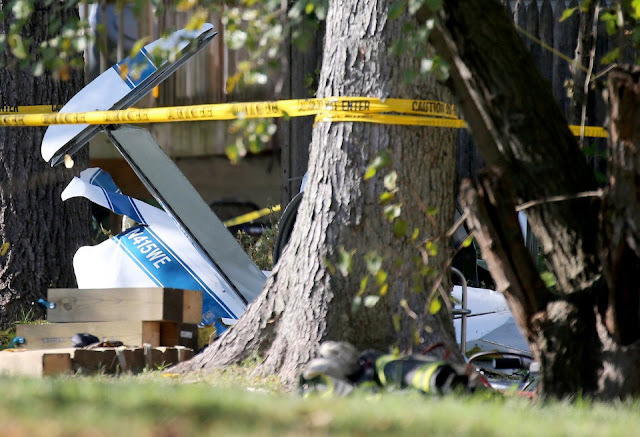 At first, Lena and Peter Pullella didn’t realize the plane had crashed three houses away from their restaurant, Pullella's Pizza Parlor. But then they saw emergency responders swarming the neighborhood, blocking access on Berlin Road. A firefighter ran into their shop and asked for two bottles of water for the victims. "I was shocked," said Peter Pullella. 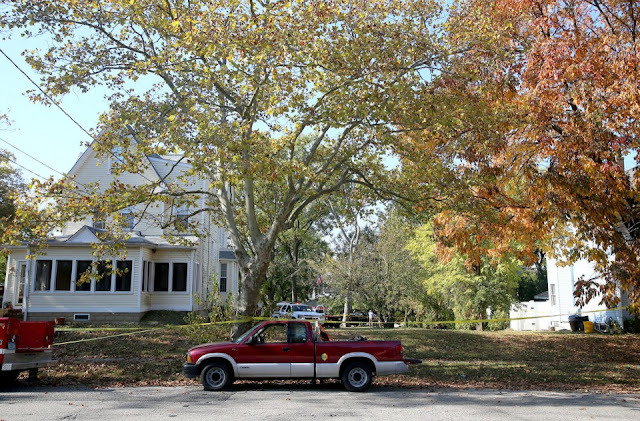 "I've been here 30 years — and zero plane crashes." 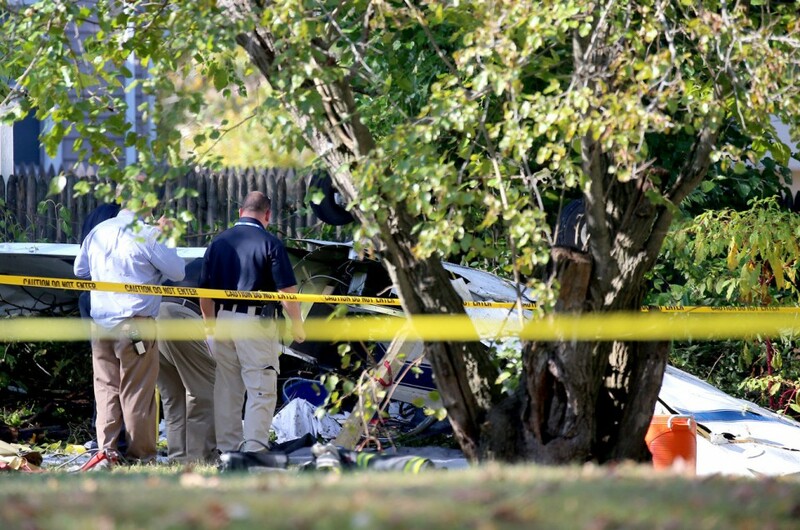 Rod Cooper, an Elm Avenue resident, came to the scene expecting to find a traffic accident. "Unbelievable," he said, staring at the crashed plane from a neighboring lawn. "Planes are always flying over our houses. You never think one's going to come down." The pilot reported that while in a left turn during an aerial application flight the airplane encountered a gust of wind and began to "shake", so he leveled the wings momentarily before continuing the turn. 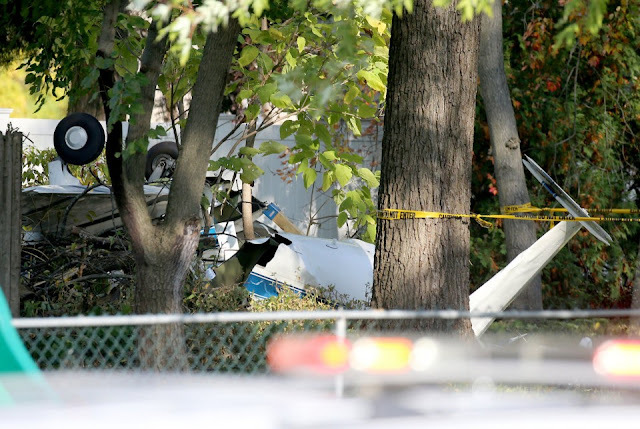 He further reported that he was looking at the field instead of where he was turning and when the airplane was 30-50 feet above the ground he looked up and saw electrical wires. The right wing tip struck the electrical wires and the airplane made a forced landing in a nearby pond. 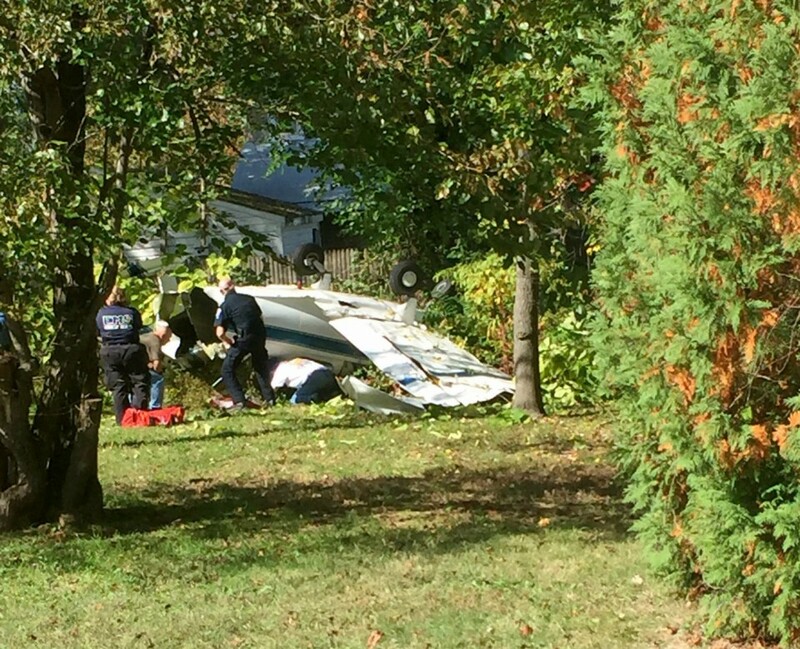 The airplane sustained substantial damage to the both wings and fuselage. 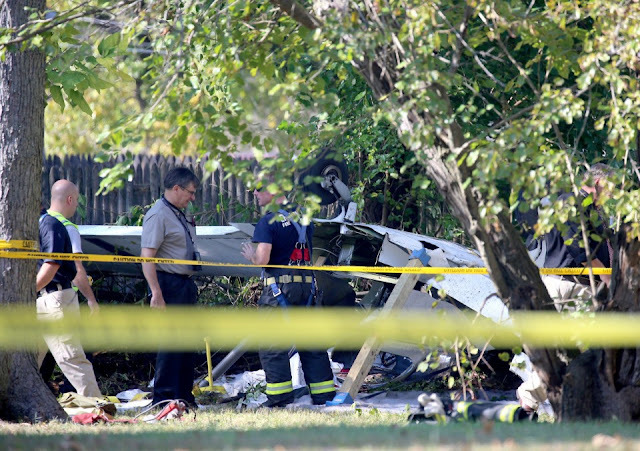 The pilot also reported that during the day of the accident he was under stress and his head was "in another place". The pilot reported that there were no preaccident mechanical failures or malfunctions with the airframe or engine that would have precluded normal operation. 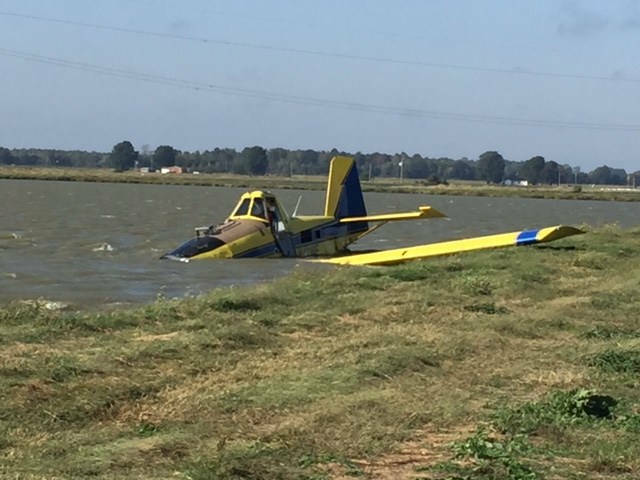 PARAGOULD, AR (KAIT) - A pilot is safe after a plane crash in Greene County. 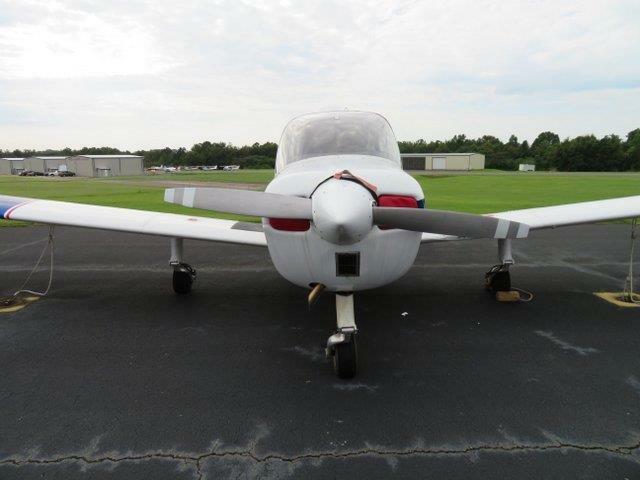 The plane was found just off Highway 135 in Paragould Tuesday morning. Greene County Sheriff David Carter said the plane was discovered in a pond. When it was discovered, nobody was on the plane. 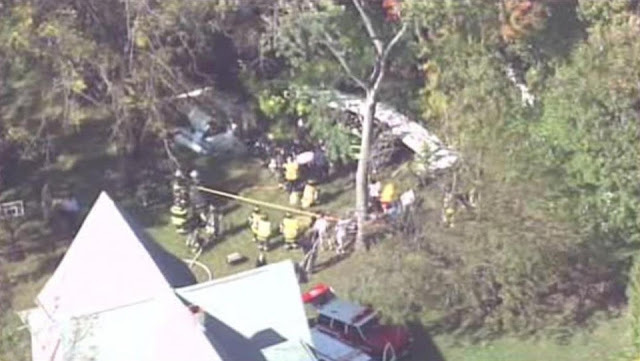 Sheriff's deputies found the pilot at the airstrip where he took off. 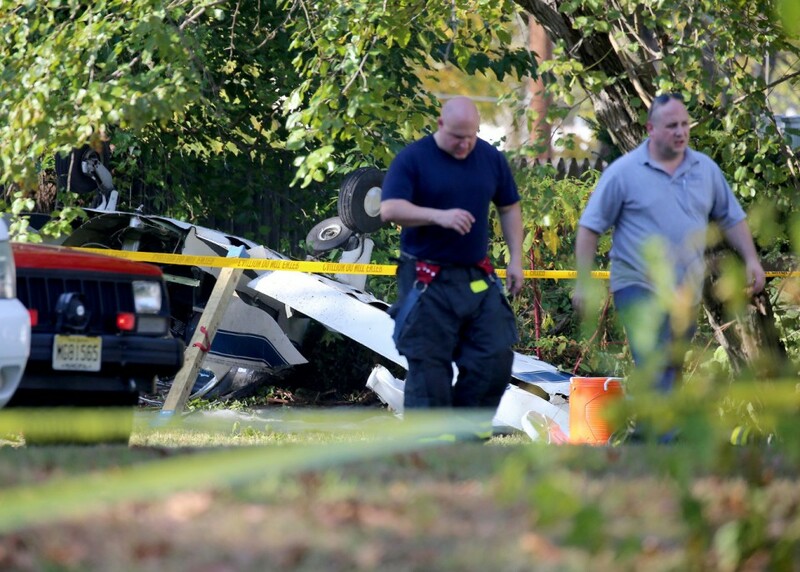 The pilot said the wind caused problems at which time he flew through some power lines and crashed. 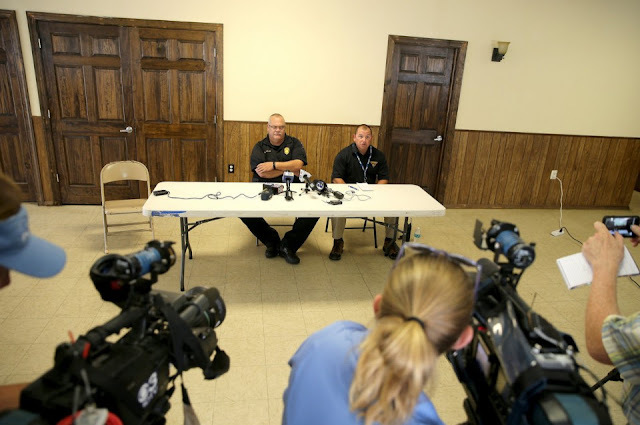 "Speaking with him briefly," Carter said, "he said the wind was a big factor in it. 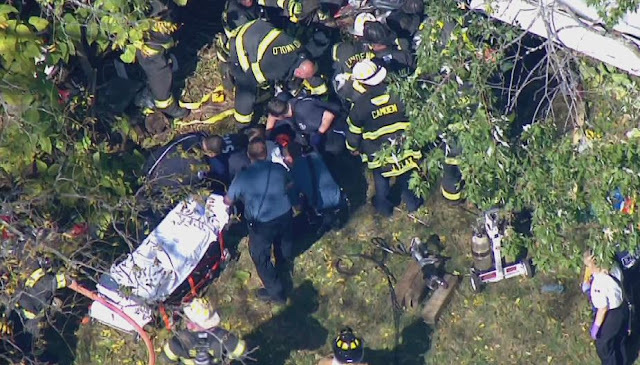 It looks like he did hit some high line wires and did go down." GCSO did confirm the pilot was safe. Carter said the pilot sprayed a field west of the crash site and was headed back to the airstrip when he crashed. 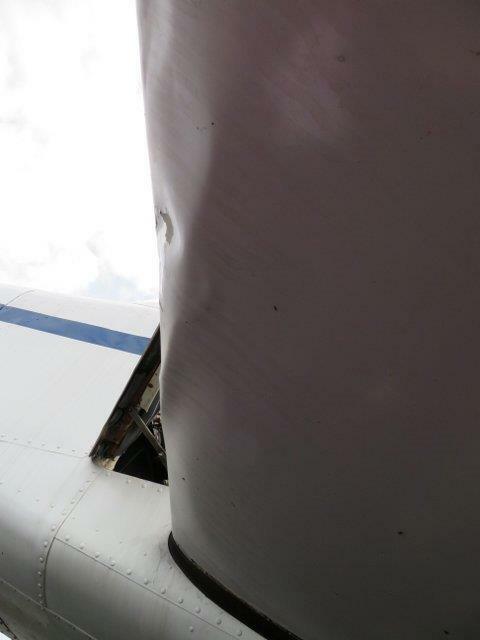 FEDEX FLIGHT FDX415, REGISTRATION NOT REPORTED, ON ROLLOUT, SUSTAINED UNKNOWN DAMAGE TO NUMBER 1 ENGINE, MEMPHIS, TENNESSEE. 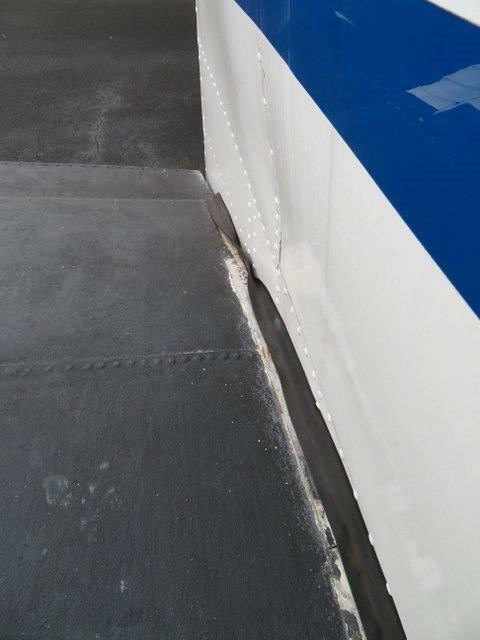 On October 18, 2016, about 1020 central daylight time (CDT), a Stinson 108, N97634, experienced a loss of control during a second landing attempt in high-gust wind conditions at Austin Executive Airport (EDC), Austin, Texas. The airplane sustained substantial damage to the left wing and aileron. 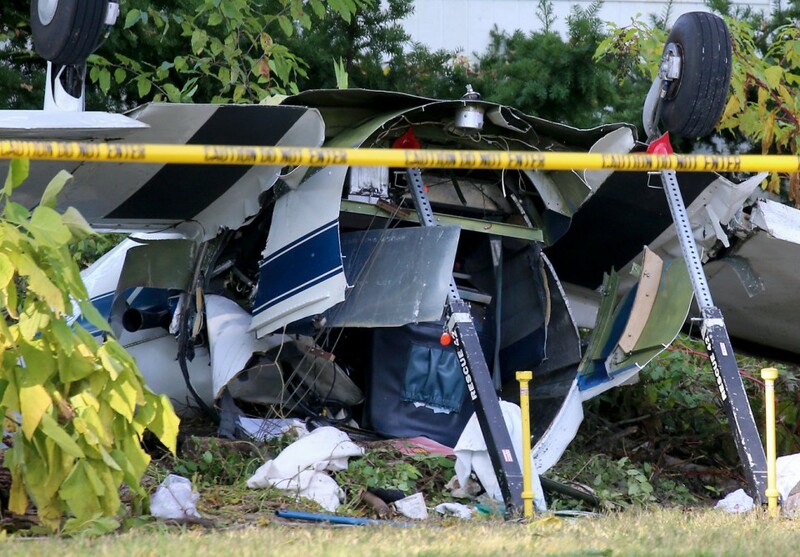 The private pilot, the sole occupant, was not injured. The airplane was privately registered and operated under the provisions of 14 Code of Federal Regulations Part 91 as a personal flight. Visual meteorological conditions prevailed for the flight, and no instrument flight rules flight plan was filed. 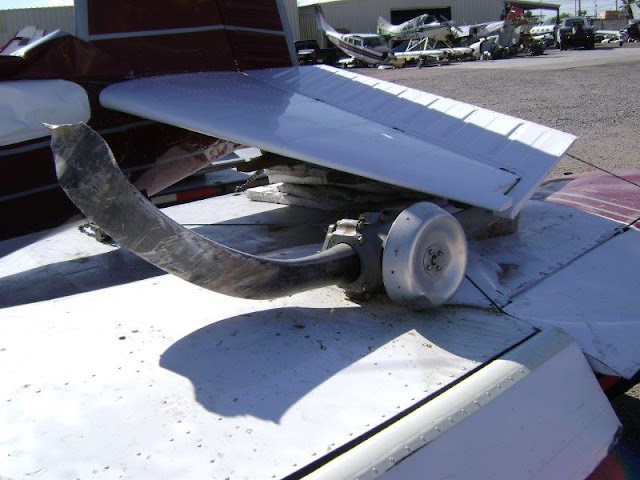 On October 18, 2016, about 1015 central daylight time, a Cessna T210L airplane, N210LC, registered to Ventana Development Brazos LLC, Bay City, Texas, sustained substantial damage after the right main landing gear collapsed upon landing at the Austin Executive Airport (EDC), Pflugerville, Texas. 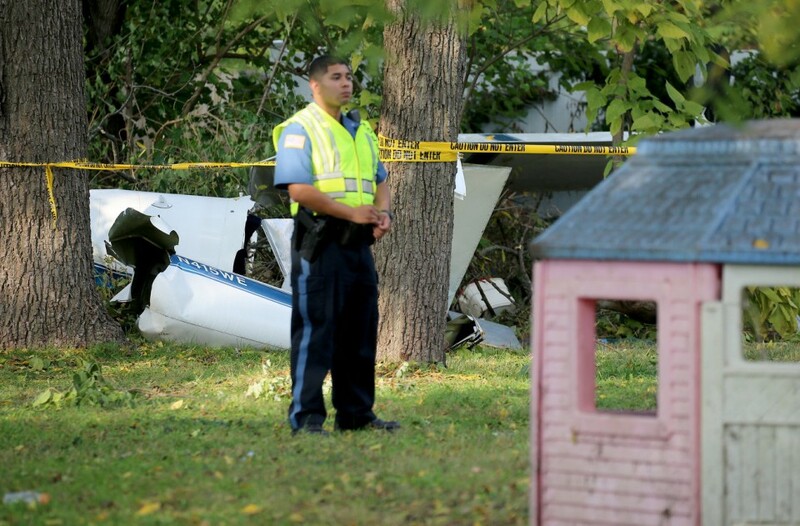 The private pilot and one passenger were not injured. 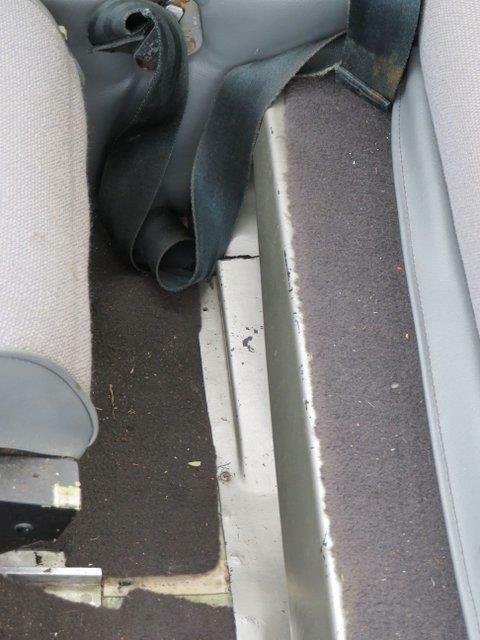 The cross country flight was being conducted under the provisions of Federal Code of Regulations Part 91. 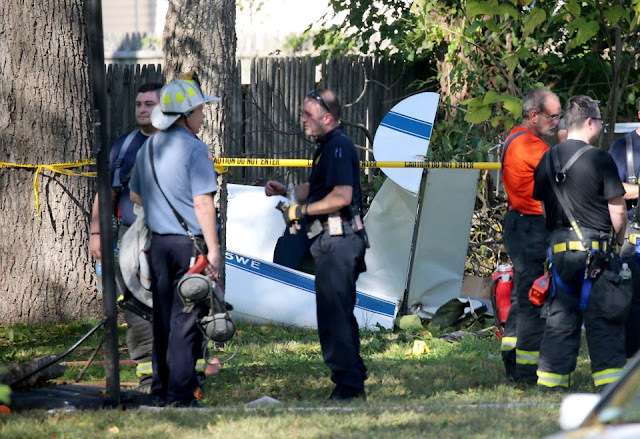 Visual meteorological conditions prevailed in the area and a flight plan was not filed. The flight originated from the Bay City Airport (BYY), Bay City, Texas, about 0915. 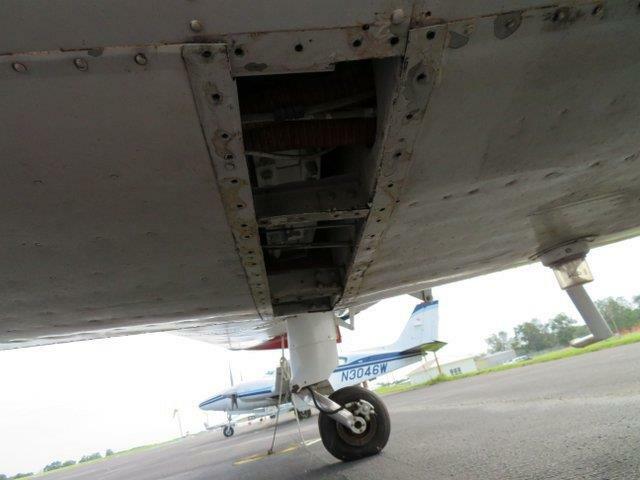 According to the pilot, upon approaching EDC, he lowered the landing gear but did not have a down-and-locked indication in the cockpit and utilized the emergency gear extension handle to lower the gear. He asked the tower on UNICOM frequency to visually check that the landing gear was extended as he executed a fly-by down the runway. He said that the tower told him that the landing gear appeared to be extended. The pilot circled and landed. Upon, landing, the right main landing gear collapsed and the airplane skidded off the runway to the right. 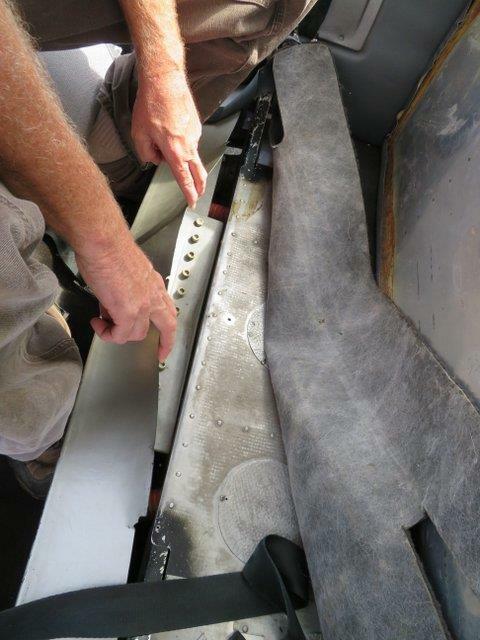 Initial inspection of the airplane by an FAA inspector revealed a hydraulic fluid leak when the system was pressurized when the emergency gear handle was activated and the hydraulic pump circuit breaker was found tripped. 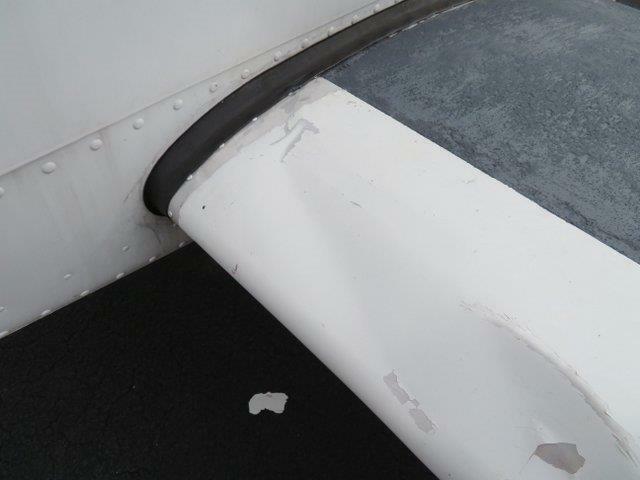 DESCRIPTION OF ACCIDENT: Landed very hard before lip of asphalt runway. Nose gear bent. Both MLG bent. Both wings bent at wing root and leading edge. No prop strike. DESCRIPTION OF DAMAGES: Nose gear canted right. Both MLG bent. 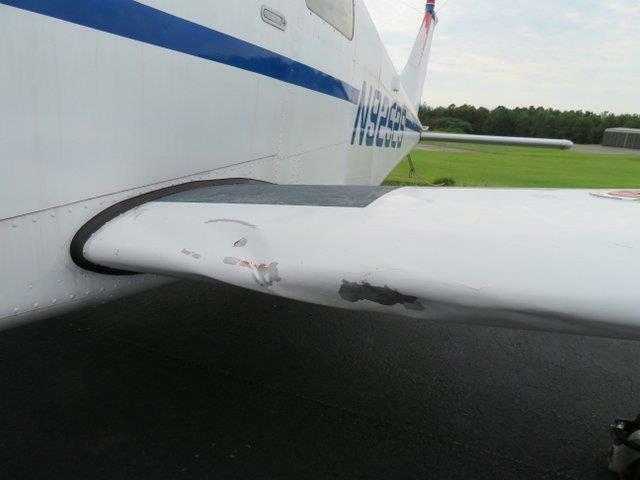 Wings compression damage at leading edge. One flap up, one flap down. NO prop strike! 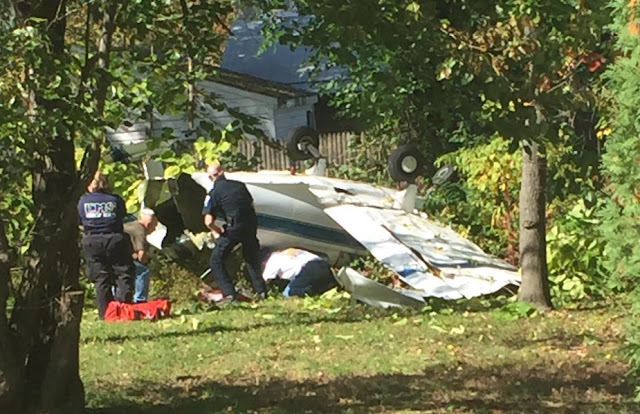 REMARKS: Airplane is tied down on ramp.